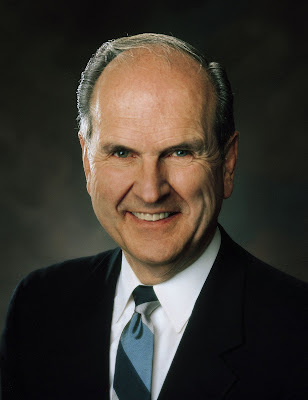 Our Stake had the unique privilege of having Elder Russell M. Nelson, from the Quorum of the 12 Apostles preside at our Stake Conference this weekend. It was an incredible experience hearing from one of the Lord's witnesses. After the adult session Saturday evening, he stood ready to shake the hands of the entire congregation. It was an honor to meet him, shake his hand and utter a simple "thank you" to someone that I know is so close to our Savior. I know he is a true servant of God.